Artbeat Rooms v Lisabon, Portugalsko: Zarezervujte nyní! We offer the maximum of comfort a traveler could wish for in our 7 double rooms, full of colours and style, each one inspired by a different artist (Picasso, Warhol, Hirst, Matisse, Bacon, Basquiat and Van Gogh). 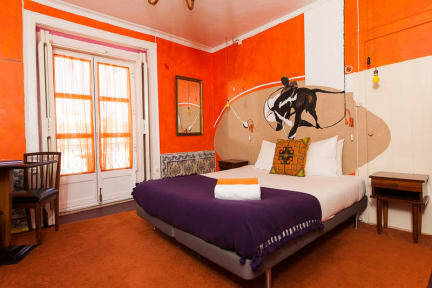 These exceptional personalities created true works of art and we gathered them under one roof, bringing a bohemian touch to this most unique guesthouse in the downtown of Lisbon. PLEASE NOTE: we do NOT have en-suite rooms: ALL BATHROOMS ARE SHARED. 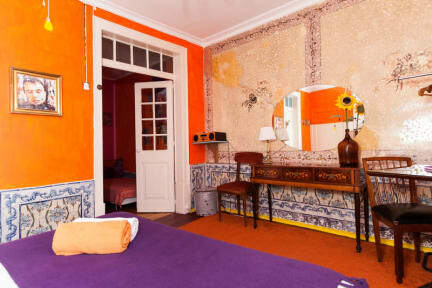 Located in the very center of Lisbon in an 18th century charming building, just between Alfama, a traditional Portuguese neighbourhood, famous for its fado music, and Bairro Alto, a trendy yet old neighborhood known for its bars, restaurants and vintage shops. We are right next all transports (buses, trams - famous 28 tram, metro and airport shuttle), but in fact Artbeat is so central that most of the things are within a walking distance. There is a fully equipped kitchen, free tea, coffee and fruit available the whole time. We provide a self-serviced breakfast which you can have in the living room or at our little sunny balcony. In our big fridge you will also find soft drinks as well as some typical Portuguese drinks at a good price. Here “the music killed the TVstar” - instead of TV we offer you stereos with music carefully chosen for each room as well as art books and magazines. We have homemade maps at your disposal. You can also count on some great tips regarding places not to be missed in Lisbon as well as up-to-date events information. Prepare yourself for a visit in an old friend’s house and take back some memorable times. With us you will not only discover a new city but a new definition of art!